Zumbi dos Palmares: hero of the black resistance against slavery and racial injustice. This fight is still relevant AND necessary today. Mestre Bimba: an Africa descendant whose preservation of culture from Bahia and innovations have reverberated throughout the world of Capoeira. Till this day they remain symbols of resistance and have brought together people from various cultures & backgrounds in unity. We have 3 days packed with various teachers passionate about transmitting cultural heritage through ancestral movements. 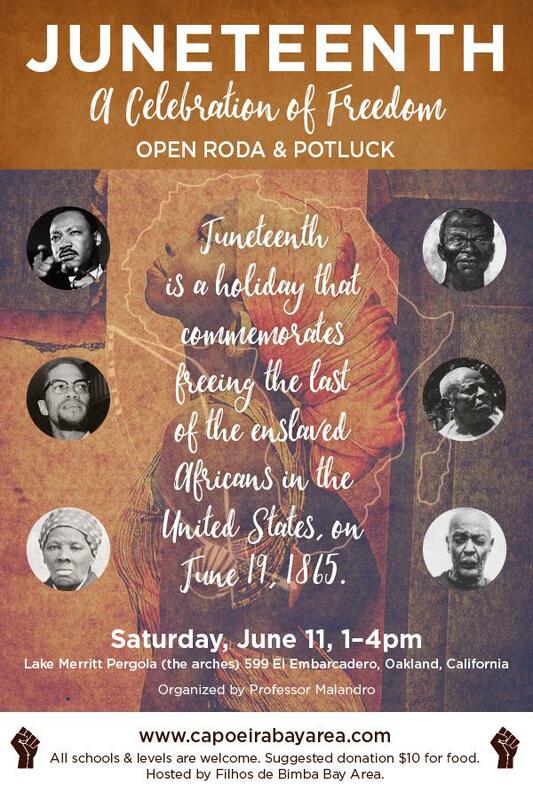 Come join us for our 4th annual JUNETEENTH open roda. This celebration will be on Saturday, June 2nd, 1pm-4pm at Lake Merritt by the arches. There will be a potluck afterwards. This is a FREE community event. Please notify us if you would like to contribute a dish or give a $10 donation (*) to help cover food and drink expenses for the community. Everyone please come in WHITE to pay homage to the capoeiristas of old that would wear their best clothes to church or to a party, and then take part in capoeira afterward. This could be your white capoeira uniform or other white clothes that are comfortable to play in. If you can keep your clothes clean while playing — it shows your skill! JUNETEENTH is the oldest known celebration commemorating the ending of slavery in the United States. The Emancipation Proclamation signed by President Lincoln on January 1, 1863, freed the enslaved Africans from southern states in rebellion against the US during the Civil War. News of the signing did not reach Galveston, Texas until June 19, 1865. On June 19th (shortened to JUNETEENTH), enslaved Africans flooded the streets, rejoicing in their newly discovered freedom. As a tribute to the freedom of our ancestors and as part of the Juneteenth celebrations, Capoeira teachers of African descent will be here to celebrate with an open roda and workshop exchange. From the Bay, New York and LA, each running their own schools representing different capoeira lineages: Prof. Malandro, Mestre Xango, Contra Mestre Omi, Prof. Caimãn and Contra Mestre Muito Tempo, Contra Mestre Versatil and more will be here. What was once practiced in secret in the slave quarters of Brazil, today is celebrated in public to honor our connection to African descendants disbursed throughout the world, and to honor their struggle for freedom. On June 2nd we come together and share our Capoeira in the traditions that was handed down to us as a tool of resistance, expression and connection to the spirit. In the roda we connect to our ancestors, to each other, and to future generations. JUNETEENTH is a time of celebration, but also a time of reflection, healing, and hopefully a time for the community to come together. It is a time for assessment, self-improvement and for planning the future. In cities across the country, people of all races, nationalities and religions come together to truthfully acknowledge a period in our history that shaped and continues to influence our society today. (*) If you would like to make a donation to help us cover food expense in advance you may do so with Venmo @Malandro81 or paypal to malandromandinga@gmail.com as the recipient email Choose your amount Click on the Personal tab and select gift so that we will receive ALL of your payment, instead of Paypal administrative fees! Please put your name (real on or Capoeira) and Juneteenth 2018 so that we can show appreciation for your contribution. 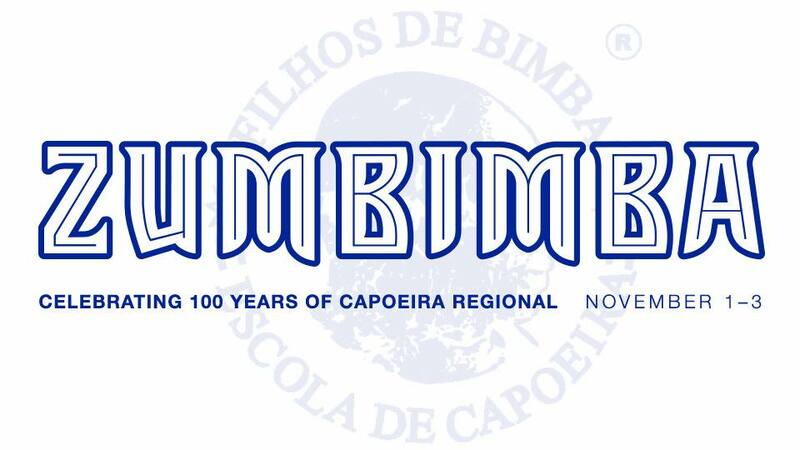 Come celebrate Malandro’s milestone of 20 years of Capoeira at ZUMBIMBA 2017 from November 2nd through November 4th! This year’s event will feature Mestre Nenel, the son of Mestre Bimba, as a special guest! Register for Zumbimba by clicking this link and filling out the form! Payments can be made online via Venmo with the username @malandro81 or you can Paypal malandromandinga@gmail.com. Rainha Nalvinha – Mestre Bimba’s daughter and a Mestra de samba! Mestre Canguru of Filhos de Bimba – an amazing singer, composer, musician and teacher of Capoeira. He will have handcrafted engraved berimbaus for sale as well as his acclaimed CD. 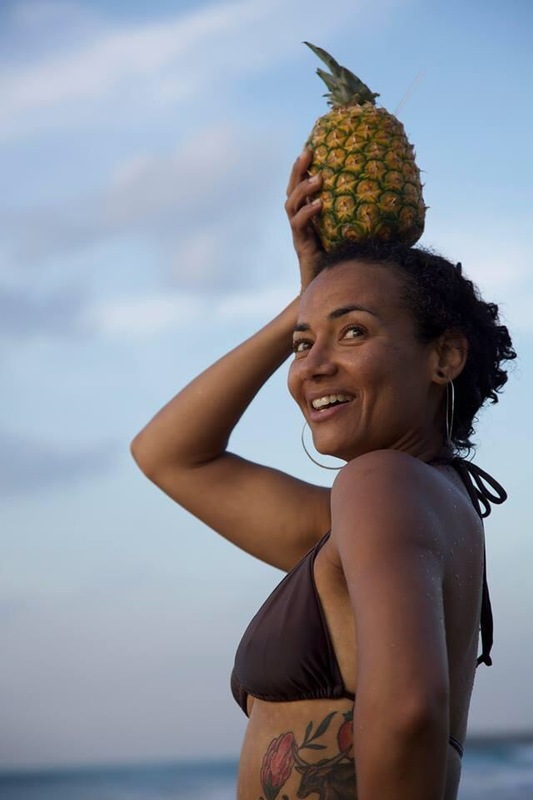 Mestra Preguiça – The first and only female Mestre of Capoeira Regional. She is an awesome capoeirista, dancer and is highly respect as a reference for Capoeira Regional. Mestra Sambambaia aka Nives Wetzel de Cediel! 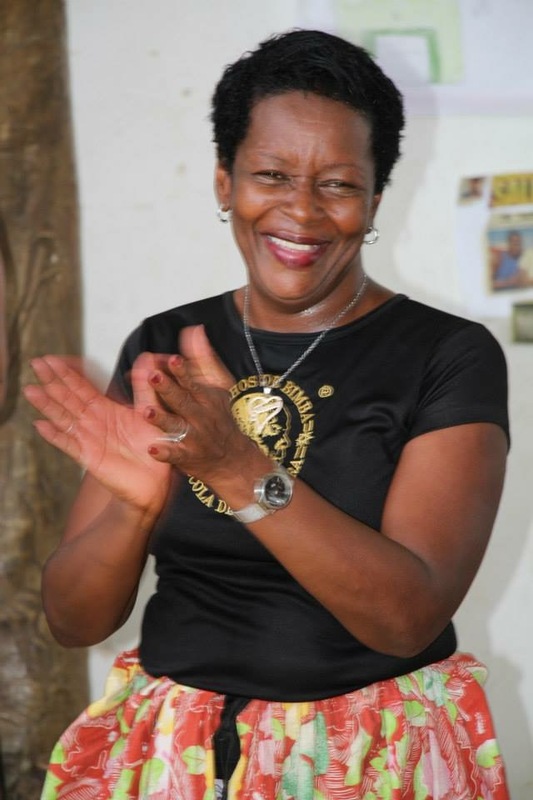 Nives is the founder and artistic director of Omi Tutu* dance organization. 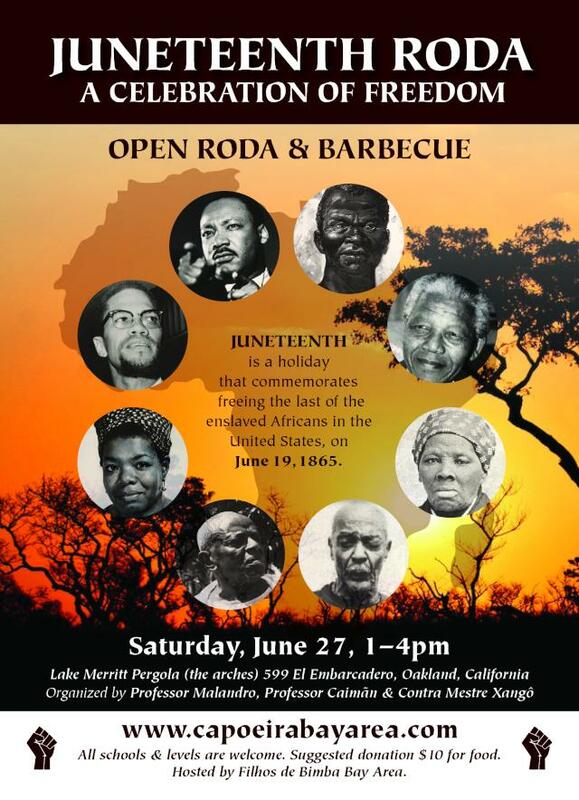 Come celebrate the 3rd annual JUNETEENTH open roda. This celebration will be on Saturday, June 11, 1pm-4pm at Lake Merritt by the arches. There will be a potluck afterwards. Please notify us if you would like to contribute a dish or give a $10 donation (*) to help cover expenses or food and drink for the community. Everyone please come in WHITE to pay homage to the capoeiristas of old that would wear their best clothes to church or to a party, and then take part in capoeira afterward. This could be your white capoeira uniform or other white clothes that are comfortable to play in. If you can keep your clothes clean while playing — it shows your skill! What is Juneteenth? JUNETEENTH is the oldest known celebration commemorating the ending of slavery in the United States. The Emancipation Proclamation signed by President Lincoln on January 1, 1863, freed the enslaved Africans from southern states in rebellion against the US during the Civil War. News of the signing did not reach Galveston, Texas until June 19, 1865. On June 19th (shortened to JUNETEENTH), enslaved Africans flooded the streets, rejoicing in their newly discovered freedom. As a tribute to the freedom of our ancestors and as part of the Juneteenth celebrations, 6 Capoeira teachers of African descent will be here to celebrate with an open roda and workshop exchange. From the Bay, New York and LA, each running their own schools representing different capoeira lineages: Prof. Malandro, Contra Mestre Xango, Prof. Caimãn, Contra Mestre Omi, Contra Mestre Muito Tempo and Instrutor Saracuru will be here. Sunday: Workshop Exchange Time: 11-2:30 p Location: Ellen Webb Studios 2822-A Union St.
What was once practiced in secret in the slave quarters of Brazil, today is celebrated in public to honor our connection to African descendants disbursed throughout the world, and to honor their struggle for freedom. On June 11 we come together and share our Capoeira in the traditions that was handed down to us as a tool of resistance, expression and connection to the spirit. In the roda we connect to our ancestors, to each other, and to future generations. JUNETEENTH is a time of celebration, but also a time of reflection, healing, and hopefully a time for the community to come together. It is a time for assessment, self-improvement and for planning the future. In cities across the country, people of all races, nationalities and religions come together to truthfully acknowledge a period in our history that shaped and continues to influence our society today. (*) If you would like to make a donation to help us cover food expense in advance you may do so online at www.paypal.com: Click on the “Send Money” tab Fill in malandromandinga@gmail.com as the recipient email Choose your amount Click on the Personal tab and select gift so that we will receive ALL of your payment, instead of Paypal administrative fees! Please put your name (real or Capoeira) and Juneteenth 2016 so that we can show appreciation for your contribution. Celebrate the third anniversary of Filhos de Bimba Bay Area School of Capoeira! Join us for an evening filled with exciting capoeira performances, Dança Afro, traditional Brazilian music, a delicious dinner, exciting raffles, and lots of fun for the whole family. Mark your calendars! Sunday, April 10, 2016 First Congregational Church of Oakland (across from Whole Foods) 2501 Harrison St Oakland, CA 94612 Doors open at 4:30pm Event lasts from 5:00pm to 7:00pm Pricing: $18.00 ($19.62 w/service fee) Kids & Students (must show valid ID) $20.00 ($21.69 w/service fee) Individual $60.00 ($63.09 w/service fee) Family (up to 4 people) $25.00 Individual tickets will also be on sale at the door. Tickets are on sale now at Brown Paper Tickets. Filhos de Bimba Bay Area School of Capoeira will be presenting Capoeira and other manifestations of the Afro Brazilian culture. Mestra Sambambaia-Nives Wetzel de Cediel and her wonderful dance group, Omi Tutu, will be joining the festivities presenting Dança Afro. Dança Afro is a contemporary representation of African Brazilian dance forms. It is well grounded in the aesthetics of West African-based diaspora dance. 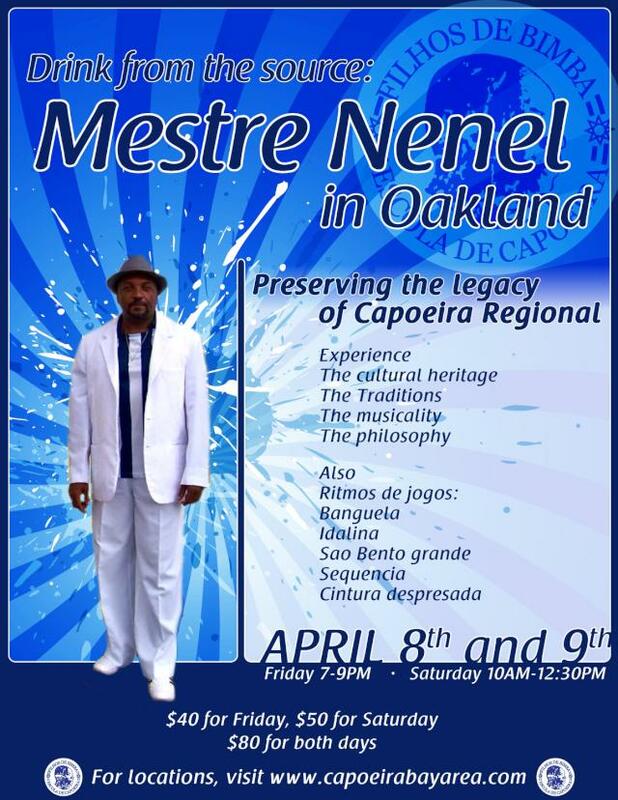 Our special guest is Mestre Nenel, who will be visiting all the way from Salvador, Bahia, Brazil. Mestre Nenel—Manoel Nascimento Machado, the son of Mestre Bimba and founder of Filhos de Bimba Escola de Capoeira will honor our Anniversary Dinner with his presence. Take advantage of this excellent opportunity to share a fun-filled evening with such an important person in our community. Bring your friends and family!! Mestre Nenel, the son of Mestre Bimba returns to the Bay Area for our 3rd Drink from the source event. The term “Drink from the source” means to receive the essence in its purest form. It is two days of workshops open to the community. This is a great opportunity not just to learn movements but to gain knowledge as you experience the history, culture traditions, principles and vision of Mestre Bimba’s work; A work that has influenced the world of capoeira until today! Salve! Come join Filhos de Bimba – Bay Area for our annual event, ZUMBIMBA! We have 3 days jammed packed with classes Brazil’s various manifestations of the African diaspora. Enjoy the moviements and history of Maculelé, Puxada de Rede, Dança Afro, Samba de Roda and of course Capoeira, along with lots of rodas and refreshments. All levels are welcome. This event is a celebration meant to bring together the diverse groups and pass on knowledge as we experience the culture of Bahia Brazil. This year’s event will be a historic one. For the first time in the US we have Mestre Bimba’s daughter, Rainha Nalvinha! She has been performing with her fathers Samba group since she was a little girl and she will be bringing that history, culture and movement to the event. We are excited to announce that we will have the first and only female Mestre of Capoeira Regional, Mestra Preguiça! Mestra Preguiça is 2nd generation Bimba, a student of Mestre Nenel and is an awesome capoeirista, dancer and is highly respect as a reference for Capoeira Regional ZUMBIMBA is an annual celebration which was started in November 1991 by Filhos de Bimba – Escola de Capoeia to honor the legacies of two powerful men in the history of Africans in Brazil—Zumbi dos Palmares and Mestre Bimba (Manuel dos Reis Machado). The contributions of these two men have elevated the consciousness of Afro-Brazilians and have brought together people from various cultures & backgrounds in unity. Back by popular demand, Professora Samambia aka Nives Wetzel de Cediel! Nives is the founder and artistic director of Omi Tutu. Omi Tutu (fresh water in Yoruba) She is a incomparable samba and Dança Afro teacher! To expedite the registration process, you may preregister online and gain quick and easy priority access to the Zumbimba event! ***We also accept Square Cash and Venmo*** Can’t make our event but still want to support the preservation of the art, culture and history? Please follow the instructions below. Please put your Capoeira or real name and Zumbimba2015 so that we may include you in our appreciation video after the event. Welcome to our 2nd annual JUNETEENTH Roda. This celebration will be on Saturday, June 27, 1pm-4pm Lake Merritt Pergola (the arches), Oakland CA BBQ afterwards. This event is FREE! We are asking for $10 donation (*) to help cover expenses for food and drink for the community. Everyone please come in WHITE to pay homage to the capoeiristas of old that would wear their best clothes, white linen, to church or to a party, and then take part in capoeira afterward. Just to clarify what to wear for the roda, this could be your white capoeira uniform or other white clothes that are comfortable to play in. If you can keep your clothes clean while playing — it shows your skill! Click on the Personal tab and select gift so that we will receive ALL of your payment, instead of Paypal administrative fees! Please put your name (real or Capoeira) and Juneteenth 2015 so that we can show appreciation for your contribution after the event. JUNETEENTH is the oldest known celebration commemorating the ending of slavery in the United States. The Emancipation Proclamation signed by President Lincoln on January 1, 1863, freed the enslaved Africans from southern states in rebellion against the US during the Civil War. News of the signing did not reach Galveston, Texas until June 19, 1865. On June 19th (shortened to JUNETEENTH), enslaved Africans flooded the streets, rejoicing in their newly discovered freedom. In Oakland, as a tribute to the freedom of our ancestors, three African American teachers from different capoeira lineages (Prof. Malandro, Prof. Caimãn and Contra Mestre Xango) have joined together to have a roda. What was once practiced in secret in the slave quarters of Brazil, today is celebrated in public to honor our connection to African descendants disbursed throughout the world, and to honor their struggle for freedom. On June 27 we come together and share our Capoeira in the traditions that was handed down to us as a tool of resistance, expression and connection to the spirit. In the roda we connect to our ancestors, to each other, and to future generations. JUNETEENTH is a time of celebration, but also a time of reflection, healing, and hopefully a time for the community to come together. It is a time for assessment, self-improvement and for planning the future. In cities across the country, people of all races, nationalities and religions come together to truthfully acknowledge a period in our history that shaped and continues to influence our society today. Celebrate the 2nd Anniversary of Filhos de Bimba California Bay Area School of Capoeira with an inspiring evening filled with beautiful dance, exciting capoeira performances to traditional Brazilian music, dinner, live music, an exciting raffle and lots of fun. Save the date for 3.28.15, and hope to see you there! Experience the rich and diverse culture of Brazil through the rhythmic music of the berimbau and other traditional instruments, performances of Puxada de Rede, the dance celebrating the fishermen’s daily life, and Maculele, a dramatic and high-energy mock-combat dance using grimas (sticks). The event will be held on Saturday, March 28th, 2015, in the main hall of the historic 1930’s art deco Veterans Memorial building at 4321 Salem St. Emeryville, CA 94608. Get your tickets at: http://www.brownpapertickets.com/event/1273649 Filhos de Bimba School of Capoeira follows the methodology and traditions of Capoeira Regional set forth by Mestre Bimba (Manoel dos Reis Machado), the founder of modern Capoeira. All proceeds and contributions will help support the community work of Filhos de Bimba Bay Area School of Capoeira, in promoting cultural exchange, bringing awareness and pride to African manifestations, and lastly to preserve the traditions and principles of Capoeira Regional in the Bay Area. Join Filhos de Bimba – Bay Area for our annual event, ZUMBIMBA! We have 3 days jammed packed with classes in various manifestations of the African diaspora. We will have classes in Maculelé, Puxada de Rede, Dança Afro, Samba de Roda and of course Capoeira, lots of rodas and a delicious dinner. All schools and levels are welcome in our home. This event is meant to bring together the diverse groups of the bay area to educate and celebrate our ancestry of the past to help guide our future. 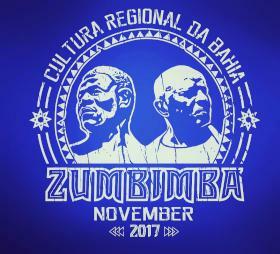 ZUMBIMBA is an annual celebration which was started in November 1991 by Filhos de Bimba – Escola de Capoeia to honor the legacies of two powerful men in the history of Africans in Brazil—Zumbi dos Palmares and Mestre Bimba (Manuel dos Reis Machado). The contributions of these two men have elevated the consciousness of Afro-Brazilians and have brought together people from various cultures & backgrounds in unity. A Celebration of Freedom!! 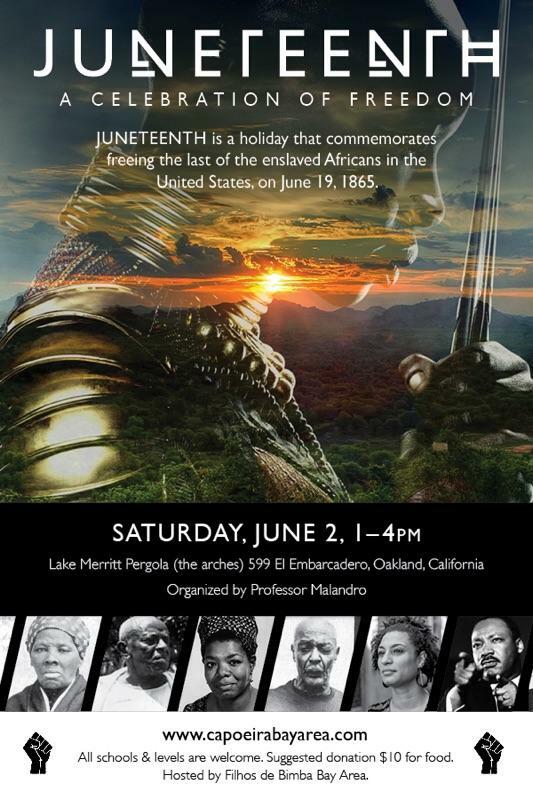 Saturday, June 14, 1pm-3pm Lake Merritt Pergola (the arches), Oakland CA JUNETEENTH is a celebration of African American freedom and achievement that encourages continuous self-development and respect for all cultures. JUNETEENTH is the oldest known celebration commemorating the ending of slavery in the United States. The Emancipation Proclamation signed by President Lincoln on January 1, 1863, freed the enslaved Africans from southern states in rebellion against the US during the Civil War. News of the signing did not reach Galveston, Texas until June 19, 1865. On June 19th (shortened to JUNETEENTH), enslaved Africans flooded the streets, rejoicing in their newly discovered freedom. JUNETEENTH is a time of celebration, but also a time of reflection, healing, and hopefully a time for the community to come together. It is a time for assessment, self-improvement and for planning the future. In cities across the country, people of all races, nationalities and religions come together to truthfully acknowledge a period in our history that shaped and continues to influence our society today. In Oakland, as a tribute to the freedom of our ancestors, three African American teachers from different capoeira schools have joined together to have a roda. What was once practiced in secret in the slave quarters of Brazil, today is celebrated in public to honor our connection to African descendants disbursed throughout the world, and to honor their struggle for freedom. On June 14 we come together and share our capoeira in the traditions that was handed down to us as a tool of resistance, expression and connection to spirit. In the roda we connect to our ancestors, to each other, and to future generations. Juneteenth is the oldest known celebration commemorating the ending of slavery in the United States. Dating back to 1865, it was on June 19ththat the Union soldiers, led by Major General Gordon Granger, landed at Galveston, Texas with news that the war had ended and that the enslaved were now free. Note that this was two and a half years after President Lincoln’s Emancipation Proclamation – which had become official January 1, 1863. The Emancipation Proclamation had little impact on the Texans due to the minimal number of Union troops to enforce the new Executive Order. However, with the surrender of General Lee in April of 1865, and the arrival of General Granger’s regiment, the forces were finally strong enough to influence and overcome the resistance. Juneteenth commemorates the freedom of African American and emphasizes education and achievement. It is a day, a week, and in some areas a month marked with celebrations, guest speakers, potlucks and family gatherings. It is a time for reflection and rejoicing. It is a time for assessment, self-improvement and for planning the future. Its growing popularity signifies a level of maturity and dignity in America long over due. In cities across the country, people of all races, nationalities and religions are joining hands to truthfully acknowledge a period in our history that shaped and continues to influence our society today. http://www.sfjuneteenth.org Today the historic San Francisco Juneteenth is one of the largest African American celebrations in California and it’s sole purpose is for historical awareness, building self esteem with our youth, connecting organizations with the community and providing opportunity for African American vendors to market their business and showcase their craft. http://www.berkeleyjuneteenth.org/about_juneteenth.html Communities nationwide have adopted JUNETEENTH as an occasion to celebrate African American culture and traditions, and as an opportunity to acknowledge contributions African Americans have made to the fabric of America. Cultural events like JUNETEENTH, celebrate diversity, and unify our nation when we all celebrate together. Click on the Personal tab and select gift so ALL of your payment will go to our school, instead of Paypal administrative fees! Please put your name (real or Capoeira) and Zumbimba so that we can add you to the list of registered guest. Location: Emeryville Senior Center, 4321 Salem Street, Emeryville, CA 94608 2nd floor! Join us for the inaugural celebration of the 1st Filhos de Bimba school in the United States! 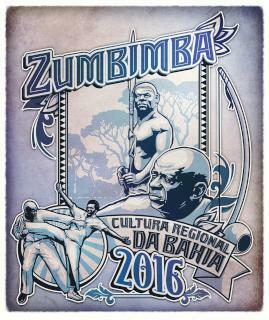 This historic 2-day event will consist of workshops in Capoeira Regional in it’s purest form, various dances from Bahia, as well as a lecture and rodas. All levels are welcome. Don’t miss this very special event!! Saturday afternoon (Berimbau class: B.Y.O.B.) : 4:30p.m.